The recent graduates visited the Dubai Centre's home campus for a second round of celebrations. 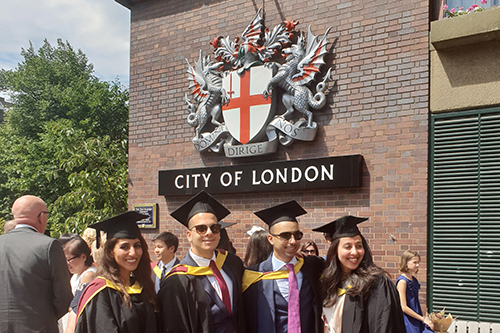 A second round of celebrations were in order this week as six students from the Dubai Centre’s 2018 Executive MBA graduate cohort attended City, University of London’s summer graduation ceremony. The students are Ayman Gadallah, Yousef Al Saleh, Rinad Khudair, Nawrus Nejaim, Ramzi Othman and Andrew Mendez. 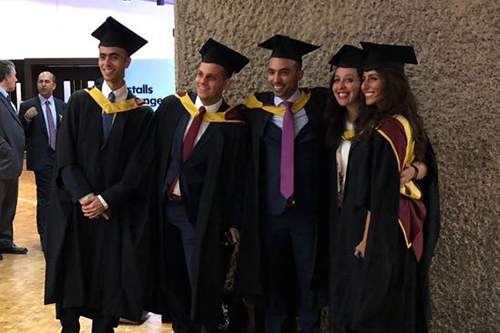 They joined thousands of students from Cass Business School, one of the University’s five schools, to celebrate the completion of their degrees at the Barbican, in the heart of the City of London. Ayman said: "I had attended the graduation ceremony in Dubai earlier this year, but I was keen to participate in the London celebrations as I wanted to connect with my peers here and expand my network." A similar sentiment was echoed by Rinad. She said: "It was a great experience attending the graduation ceremony at the University's home campus in London. Cass Business School provides students with access to a huge range of opportunities to learn from, from the professors, to the resources at campus, to the international electives. My advice to new students is to make the most of these opportunities. Find out more about the Dubai Executive MBA here.